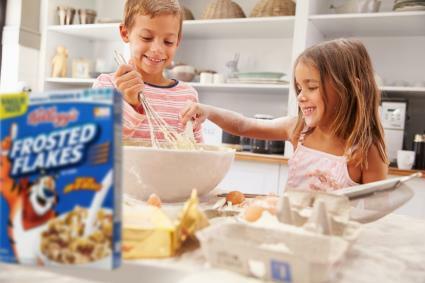 Kids are much more likely to eat foods they help prepare or prepare by themselves, and there are many fun kids' recipes available. Simple-to-fix foods with eye appeal work best for children. A bit of whimsy can also increase the appeal of new foods. When they cook, kids learn basic food preparation and food presentation techniques. In addition, they learn how to measure ingredients, using some simple math skills, such as fractions. Select firm slices of country white, sour dough, or whole grain bread and cut slices into rectangular or triangular halves. For every four slices of bread, beat 2 eggs, ¼ cup milk, and ½ teaspoon of ground cinnamon. (You may also add a dash of vanilla, if you like.) Beat egg and milk mixture until cinnamon is spread evenly through the mixture. Dip bread into the egg and milk, making sure cinnamon coats the bread evenly. Brown on both sides until egg is cooked in a lightly oiled non-stick or conventional skillet over medium heat. Serve hot sprinkled with a small amount of cinnamon and sugar. Mix a batch of your favorite waffle mix or waffle recipe. Fold ½ cup M&Ms into the well-mixed batter. Make sure your waffle iron is well seasoned or well oiled so that the M&Ms do not stick to it when they melt slightly. Bake as usual in a pre-heated waffle iron. Serve with chocolate syrup and whipped cream instead of maple syrup. Animal shapes make any food a fun kids' recipe! Mix a batch of your favorite pancake mix or pancake recipe. (You can use a whole grain pancake for this recipe.) Heat a well-oiled skillet until a drop of water dances on the heated surface. Drop pancake batter by spoonsful onto the skillet to make animal shapes. A large circle with two smaller circles makes a mouse's head. A large oval makes a dog's body; use smaller ovals for the head and legs. Finish the dog with small circles for ears. The possibilities are limited only by your imagination and skill with a batter-filled spoon. Place cheese between two pieces of bread. Lightly butter the outside of the sandwich on both sides. With cookie cutters almost the size of the bread slices, cut animal or other shapes from the sandwiches. Grill the shaped sandwiches on a griddle until the cheese melts and the bread is lightly browned. (These sandwiches are especially popular with kids who don't like crusts. Cook ground beef seasoned lightly with a bit of chili powder and cumin or shred cooked chicken. One of these will make the main filling for your tacos. Warm flour or corn tortillas. Fill with the desired meat. Let the kids put any of the items listed above in the tortillas to finish their own customized tacos. Use cookie cutters to cut cold cuts, such as bologna and salami into animal or other shapes. Use the same cookie cutters to cut thin slices of America or Swiss cheese into shapes. Serve on a plate with crackers and fruit or vegetable sticks. Make and cook meatballs or buy and reheat frozen meatballs. Make or heat your favorite spaghetti sauce. Cook and drain spaghetti. Pile the spaghetti in a large pasta bowl or a platter to make a "mountain." Place the "boulders" (meatballs) carefully on the mountain. Pour heated sauce over the completed mountain. Sprinkle with grated Parmesan or Romano cheese, if desired. Heat oven to 350 degrees. Make 6 beef patties from a pound of ground beef. Brown in a skillet until cooked to medium. Place the patties in a 13' x 9' baking pan. Cover with a large can of undiluted tomato soup. Use enough leftover mashed potatoes or prepare dried or frozen mashed potatoes to make six servings. Top each beef patty with a mound of mashed potato. Place in oven and bake about 20 minutes or until potatoes begin to brown. Serve each little "Alaska" with additional tomato soup from the pan. Preheat oven to 350 degree. Cut three chicken breasts into boneless, skinless strips about an inch wide. Beat two eggs seasoned with salt and pepper. Crush 1-1/2 cups of corn flakes to make coarse crumbs. Preheat ¼ cup olive oil or corn oil and ½ cup butter (you may use all oil) in a 13" x 9" pan in a 350-degree oven. Dip chicken in egg mixture, then in cornflake crumbs. An adult should carefully place the chicken strips in the hot oil mixture and return it to the oven. Bake for ½ hour. Serve with Ranch dressing or other dipping sauce. 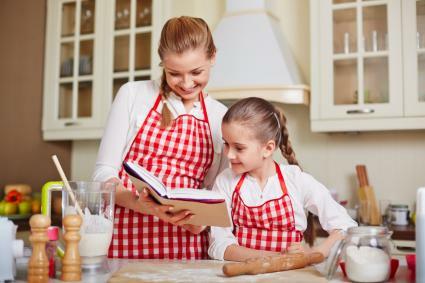 Many other fun kids' recipes can be found in kids' cookbooks at your local library or bookstore, as well in online databases of recipes.